This art therapy blog is based in Overland Park, Kansas. 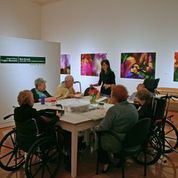 Along with writing this blog, I have spent the past eleven years conducting art therapy groups at Village Shalom Retirement Center. Village Shalom, as many know, is one of the locations of this week’s horrific hate crime which took the lives of three innocent people. Much of the media attention has focused on what took place outside of the building, but I would like to give readers of this blog some insight into what takes place inside of the building. Village Shalom is one of those remarkable places that is truly filled with love. Trite as that might sound, it is the only way to describe the facility. Dedicated employees spend their days, nights and weekends caring for a generation of people who witnessed unspeakable crimes against humanity. Many of these residents fled their countries of origin in search of a better world in the United States, and then devoted their lives to giving back to the country that took them in when other nations closed the doors to their plight. The irony of a hate crime at this particular location, with the victim being a woman whose life was dedicated to serving others, must not go unnoticed. The depth of the art therapy groups at Village Shalom, as residents face their own mortality and begin to look back on their 20th century lives, is profound. One topic which we cover often is the existential question of living well in spite of the collective upheaval and shocking atrocities many of the residents experienced during the Holocaust. From their vantage point as octogenarians and beyond, the overall message gleaned from this generation is to choose goodness in the world, to prevent the pockets of evil and hatred from flourishing.This type tenacity is one we should all apply to this week’s tragedy. In keeping with the goals of this art therapy blog, I will present a small art therapy exercise along this theme. This particular art exercise relates to the current exhibit showing in the Epsten Gallery, (a gallery located at Village Shalom) called, Looking at After: Four Contemporary Artists Reflect on Legacy l A Creative Spark: The Art of Anna Ilona Gondos. This beautiful art show includes art by a Holocaust survivor (who happened to be my husband’s grandmother), Anna Ilona Gondos. As an inmate in the Bergen-Belsen concentration camp in 1944, Anna spent her days teaching art classes to children in the camp, using sticks and dirt. The creativity, strength and courage to exhibit this type of hope in such despicable conditions illustrates the ultimate form of resilience. Another piece in the art show is by local artist, Tanya Hartman. In a series of eight giant panels, she writes the line, “What was beautiful today?” followed by something she found beautiful in her day. Her work encapsulates thousands of days of repeating this activity, until she was able to retrain her brain to automatically recognize what was truly beautiful in her day. Tapping into these two ideas, which really boil down to attitude, please find some pen and paper and write the words, “What was beautiful today?” and fill in your answer. Recovering from a trauma such as the one that the Kansas City community experienced this week? Try it for several days, and see how it can alter your attitude toward a positive place.